Being able to pass the ball well in basketball is something that every coach and team aims for. Regardless of the style of offense, the pass opens up the floor and helps to create quality shots for players. Whether it is a kick ahead pass, drive and kick, or whatever else, the pass makes the offense go. Unfortunately, though, passing at a high-level is not something that comes naturally for most players and teams. Without proper coaching and practice, players tend to over dribble or hold the ball too long. These basketball passing drills are not only going to work on the technique of different types of passes, but also when to make the pass. 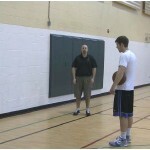 They will teach players and teams all there is to know about becoming quality passers. And, regardless of position, this is something that every player should be aiming for. From the basics of passing to backdoor passes and fill behind passes, the drills in this section will cover all of the different types of passes. This will teach players how to be able to get their teammates the ball in any type of passing situation. Ball movement is one of the lifelines of a well-oiled offense. The better the ball moves, the more the defense has to shift, which means more potential breakdowns. From ball reversals, to drive and kicks, to passing out of a ball screen, it all can add value to an offense. As a coach, if you want the ball to move, you need first to spend time teaching your players all the aspect of passing. You will need first to teach them the correct way to throw on target and on time passes. And, then once they learn how, they will then need plenty of quality repetitions to work on the actual skill of making different types of passes. These basketball passing drills are going to provide all of the passing tools that you will need for your team. The drills will teach the correct form and technique for different types of passes, and then provide good drills for them to work on it. They will also help to explain when each type of pass should be used. For example, a pass off of the dribble with one hand rather than two will hit an open cutter quicker. This will help the cutter have more time to get a shot off, re-drive, or swing before the defense can recover. This is just one example, but each type of pass exists for a specific purpose, and these drills will help explain each one. A big part of being an all-around basketball player is being able to move the ball and help set up teammates for good shots. And, whether it is the pass the leads directly to an open shot, or one in a sequence of passes that does, being a good passer adds a lot of value to a player’s game. To be a good passer though, a player needs to be able to execute a variety of different passes. One type of pass doesn’t fit every situation. Sometimes it will have to be a bounce pass, chest pass, overhead pass, off the dribble pass, etc. As a player, you should be able to execute all of these different types of passes. 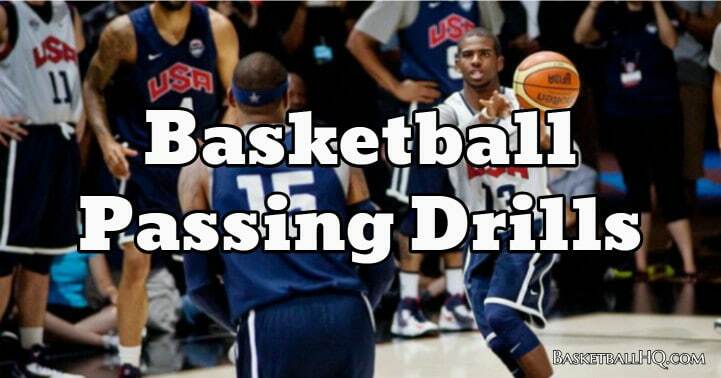 These basketball passing drills are going to allow you to be able to work on all of the different passes. Some of them are going to be basic, while some more advanced and specific. Regardless of position, you should be working on your passing. And, along with learning the technique of these different passes, make sure you pay attention to when you should be using them. The better you are able to understand when to use a specific type of pass, the better you will be able to get the ball where it needs to go. The better you are able to understand something before practicing it, the easier it will be to learn it. 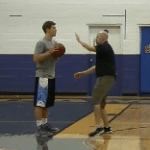 So in order to help you better take advantage of all these basketball passing drills, it is essential that you first lock in on these teaching points first. 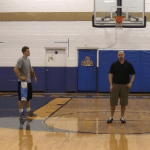 They will help you better understand what goes into being a good passer and passing team. The longer a pass is in the air, the more of a chance there is that the ball will get stolen. This means that passes need to be sharp and not floated to the receiver. The goal should be to throw every pass on a straight line to a teammate. Some of the passes will be over the top passes, but even these need to be on a line and not floated. One of the quickest ways for a player to get put on the bench is careless passing turnovers that lead to the other team getting open layups and dunks. As a passer, you are accountable for both your defender and the defenders in the help. If you are being pressured, it is important that you use pass fakes to move a defender’s hands, and also keep the off-ball defenders honest. A good terminology to use is, “fake a pass before you make a pass.” So if you have an aggressive defender or defense to account for, make sure that you are using plenty of pass fakes before you make your pass. Another critical part of passing is not telegraphing your passes. You don’t need to throw no-look passes every time, but you do need to make sure that you aren’t staring down teammates. Good off the ball defenders are going to be trying to read your eyes to jump your pass. So the more you stare down your target, the easier you make it for them. Players need to keep their eyes up and scanning the floor, and then right before they make the pass, they can look at their receiver. A big key to ball movement is timing. As a passer, in order to keep the ball moving at a high rate, you only have a short window to get the ball where it needs to go. This means that you need to be able to deliver an on time and on target pass. As mentioned earlier, you need to make sure you aren’t staring down the receiver, but you still need to be aware of when and where they need to get the ball. There are a variety of different passes, and some are more difficult than others. The last thing you want to do as a player is to start trying to throw off-hand passes that you aren’t yet comfortable with. This will lead to turnovers and easy baskets for the other team. So before you use a specific type of pass in a game, make sure that you can execute it. A great way to work on passing is during other types of drills. For example, if players are doing a basketball shooting drill, they can be working on throwing quality passes every time. They can also work on different types of passes. If players lock in on their passing during these drills, it will allow for a ton of quality repetitions. This only happens though if it is emphasized and valued. 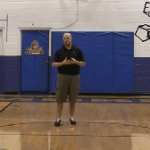 This bounce pass basketball drill is great for working on accuracy and proper mechanics.The video will show you the correct way to make the pass and then also give you some great tips for becoming a better passer. 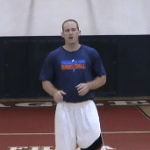 This chest pass basketball drill video will teach you first how to correctly make a chest pass, but then it will also give you a good drill for practicing the pass. The overhead pass basketball drill video is going to teach you how to correctly do the pass and then also give you a good drill for practicing this type of pass. This is a beginner partner passing drill that is going to work on the fundamentals of being able to pass off of the dribble with one hand. This two ball alternating passing drill is going to help the player work on being able to pass off of the dribble with either hand. This partner basketball passing drill is going to specifically work on the wrap around push pass which can be used to get the ball around a defender. 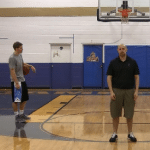 This video will show you how to do the wrap around bounce pass basketball drill, and it is instructed by an expert basketball coach and player. The video is going to work on the correct way to make the wrap around pass. This type of pass is used for feeding the post and avoiding active hands. This two ball partner passing drill is going to work on the wrap around chest pass, and is going to allow the players to get a lot of passing repetitions. This partner passing drill is going to work on making a combo dribble move and then being able to snap a push pass to your partner. This pass can be turnover prone if you do not use it the right way, or if you have not mastered it. 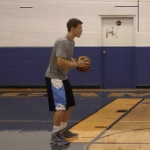 Learn the correct way to do off of the dribble bounce pass basketball drill by watching this video. The off of the dribble push pass basketball drill will help you work on the skill of being able to accurately make a pass off of the dribble. The Pressure Partner Passing Drill video will teach you have to feed the post by using pass fakes, and the correct passing fundamentals. This partner passing drill is going to work on the behind the back move and then being able to make a push pass off of the dribble. The Steve Nash partner passing drill is going to work on being able to make a push pass off of the dribble. This push pass drill is great for working on being able to pass off of the dribble with either hand. It will help the player get a lot of repetitions. The Steve Nash double crossover partner passing drill is great for working on passing off the dribble, and improving over all ball handling. The Steve Nash two ball crossover passing drill is going to help work on passing off of the dribble, as well as over all ball handling.